Star Wars 9 Leia and Lando Reunion, Rose's Mission and First Act Revealed? Star Wars 9 is midway through week three of production, and more intel continues to leak out of the Lucasfilm camp. Today we have a look at the first act in the movie, which will bring Carrie Fisher back as General Leia. By now, everyone has heard of J.J. Abrams’ Plan 9, which will utilize unseen footage from both The Force Awakens and The Last Jedi to give fans one final Carrie Fisher performance. A big chunk of that footage will be shown off during the opening moments as Leia’s main mission becomes immediately clear. Star Wars 9 is rumored to open with General Leia handing out mission orders to various members of her small band of Resistance Fighters. She is sending these individuals out to various star systems in a means to recruit more warriors, creating a new Rebellion. Star Wars 9 will jump forward in time following the closing credits of The Last Jedi. It is believed to be roughly a year later. The first fifteen or twenty minutes of the movie will allegedly be brushing off never-before-seen footage of Carrie Fisher from The Last Jedi. If we’re to believe these latest rumors, Rian Johnson shot substantial footage of Leia talking about her allies in the Outer Rim. She orders Rose, Finn, Poe and many others recruited over the past year to head out to various star systems, and bring back soldiers willing to fight against the ever-expanding First Order. Poe, Finn and Chewbacca are sent to the Outer Rim. It’s believed that recent set photos showing the trio on a mission are actually from these opening moments of the sequel. It’s stated that the First Order has moved its headquarters to the Unknown Region. They are busy trying to rule that part of the galaxy as well. At this point in time, the First Order is now schooling the universe in a fashion similar to the Empire in the original trilogy. Some in the Resistance are struggling to see why they continue fighting. Many Rebel fighters believe Kylo Ren is a great leader. This is causing a rift amongst this ragtag army. Early scenes in Star Wars 9 will find some of these Resistance recruits heading to the Unknown Region with instructions to defend it as one of the only free parts of the galaxy left. 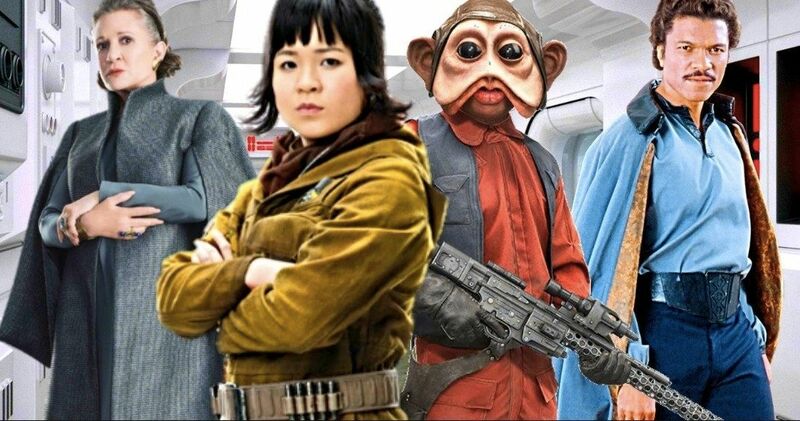 Rose will be on a special mission set up by General Leia. She won’t be paling around with Finn this time, which is probably breaking the young girl’s heart. Instead, she will be saddled with Nien Nunb. The pair are sent to find an old friend of Leia’s, General Lando Calrissian. Rose is ordered to bring Lando and Maz Kanata back to the Resistance’s home base so they can help in the fight against Supreme Leader Ren. Nien Nunb was Lando’s co-pilot when the pair destroyed the Second Death Star in Return of the Jedi. It makes sense that he’d be tasked with convincing his old friend to return to the fight. It is set up early on in Star Wars 9 that Naomi Ackie’s yet unnamed character and Chewbacca have spent the past year leading the charge to recruit new Resistance Soldiers while gathering ships and supplies. Both Chewbacca and Ackie were spotted alongside Finn and Poe in recent set photos, so it looks like they’ve been sent to the Outer Rim as well. The opening moments of Star Wars 9 will establish the Resistance’s campaign to recruit the Hutts for their fight. The Hutts are reluctant to join at first, because they know Leia as The Hutt Slayer. Her reputation for killing Jabba on his sail barge has stood tall these past thirty years. But somehow, Poe and Finn are able to convince the Hutts to join them in destroying the First Order, with the slug-like creatures providing supplies and soldiers. This means Star Wars 9 may very well give us some Hutt action, with this slimy cartel going to battle. That could be very cool. it is further rumored that the First Order is staked out on a water-esque type planet that hasn’t been officially named yet. It’s believed that this planet resides in the Unknown Region, and that fans will get to travel to this far off place in the galaxy. Further rumors claim that we’ll actually get to see a reunion between Lando and Leia, with Carrie Fisher rotoscoped into various scenes utilizing that much ballyhooed old footage. While Lucasfilm won’t be CGIing Carrie Fisher, it is believed that she will be added into new environments and given a fresh digital wardrobe. How this will all look when it’s finished is anyone’s guess at this point. Hopefully it doesn’t further destroy the Star Wars legacy and what has come before it. Using Leia as a copy and paste character could be shameful if they aren’t careful. It sounds like a game of Colorfoms. Everything mentioned in this story takes place in the first act. This latest intel comes from Drunk Chicken TV.